I recently stumbled on a Columbus, Ohio site called Easy Columbus that compiles all the things going on "off-campus" that college students might want to do. It is a very well-done site and easy to navigate. Users can search by day or event, and it even includes information about how to save money. Maybe we already have something like this here in Cincinnati. If so, please post a link in the comments section. But if we don't have this yet, we really should. Having a consolidated place for young adults to turn when they are looking for something fun and inexpensive to do seems like it would encourage them to break the monotony of the house party and bar scene. I admit - I have a hidden agenda here. By encouraging students to get off campus and experience the amazing things this city has to offer, hopefully they will be more likely to stay here after graduation. When I was at Xavier, so many of my friends came here for the education, and then bolted as soon as they had their diploma in hand. Our colleges and universities draw some of the best and brightest students to Cincinnati, and we as a city need to do everything in our power to keep that talent here. When they leave, they take with them their good ideas on how to better the city. How can we encourage those not from here to stay here? Are you talking about a site like ZipScene? There is also Metromix. But I guess both sites can be improved to be more user-friendly. If Cincinnati can't retain students staying here, neither does Columbus. This city has offered better opportunities. We have enough big companies to retain certain amount people here. And local students do have advantages over outsiders. Staying here = how many local job this city can offer. You can't ask students staying here without job offerings. Metromix and ZipScene both serve that purpose, but are not specifically geared toward college students, and, to my knowledge, not specifically marketed to college students. But you are right, both do provide that service to some degree. I agree David. There is nothing for just college students. I can say that I am a bored UC student who is always trying to find stuff to do on weekends and weekdays. I am getting tired of the same old venues. Hopefully, a website like EasyColumbus opens up for Cincinnati. On the flip side, I am starting to read blogs; they have really opened my eyes! Does Cincinnati have any sort of alternative weekly paper? NYC has the Village Voice, Chicago has the Reader, Seattle has the Stranger, etc. I'm not sure how those papers are doing compared to the mainstream dailies, but they seem to be the default option for event listings, movie reviews, bar & restaurant reviews, etc. They're not geared specifically for college students (that's what campus papers are for), but they're certainly read by plenty of college students and young adults. Cincinnati used to have two. There was CiN Weekly which was run by the Enquirer and recently shut down in favor of Gannett's national Metromix publication. The main one though is CityBeat which has been around for many years and long before CiN Weekly or Metromix. This is Cincinnati's primary alternative weekly paper. I attended Xavier also. The sad fact is that most students don't get off campus (or Norwood/Avondale). I'm going way back to the dawn of time, but don't forget Everybody's News. That's another now-dead alternative paper. It, like CityBeat, was geared to a younger demographic. I still miss Everybody's News every once in a while. You know what?! I think I'll make a blog about that! 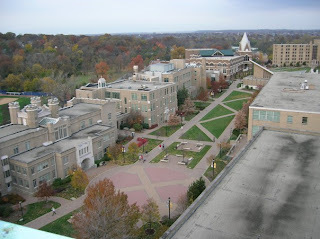 I'm a Senior at UC and even though I'll be graduating, I know a lot of the different things to do around the city as a college kid and plan on living near UC for another year and then moving downtown. I'll make a comment here after its set and I have a post. SnowLas - Awesome. Let me know if you want some help. I can prob get you some XU writers. Email me at davidcben@gmail.com.